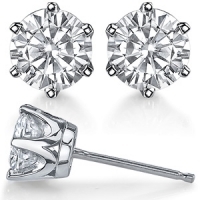 Very classic style, a perfect fit for any jewelry collection. In your choice of Solid 14k White or 14k Yellow Gold. Offered with standard push back or screwback style. 2nd white gold item picture shows screwbacks.